This recipes calles for 1 low-sodium chicken bouillon cube per onion, but you can substitute 1 low-sodium beef boullion cube for more of a “French onion soup” taste. Peel the outer layer off the onions. Slice a small section off of one end of each onion and make a hole in the center. Fill the center of each onion with 1 bouillon cube and 1 tablespoon of butter substitute. 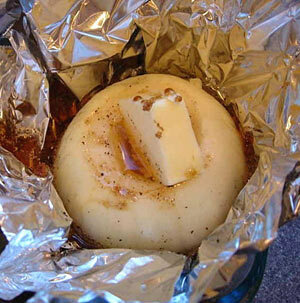 Replace the top of the onion and wrap each onion in aluminum foil. Grill for 1 hour over indirect heat with a closed lid. When done, remove the tops and cut them into bite size pieces and place them in a serving bowl with all the cooked juices. This entry was posted in Metabolic Medical Center Recipes, Modified Profast (Fast and Flexible) Recipes, Nutriplus Recipes (Balance Your Pyramid), Party & Entertaining, Vegetables and tagged beef bouillon, bouillon cubes, chicken bouillon, grill, low-sodium, metabolic diet recipes, onions, vidalia onions by foodies4mmc. Bookmark the permalink.